Brighton & Hove Albion’s Pascal Gross (£5.4m) is the first attacking player to score more than 15 points in a single Fantasy Premier League Gameweek this season. Defenders have dominated the big individual scores to this point, with Paul Pogba’s (£8.3m) total of 15 in Gameweek 2 the previous best by any midfielder or forward. 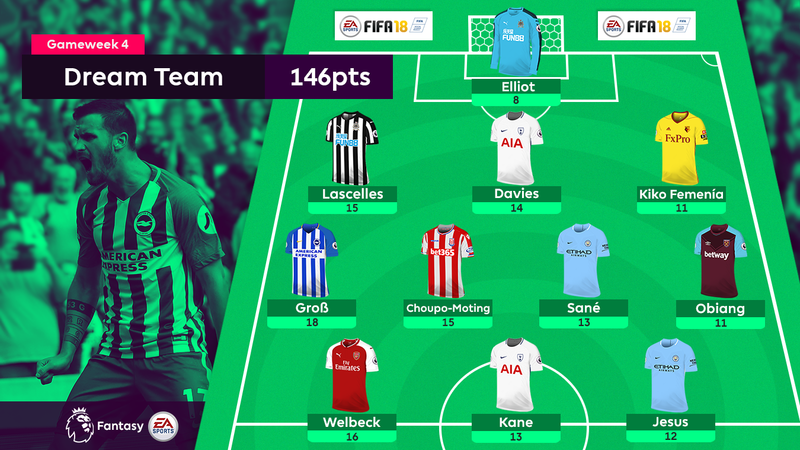 But Gross has set the new standard, claiming 18 points in the same Gameweek that an Arsenal striker also found his range to shift the Dream Team to a 3-4-3 formation. The cheapest goalkeeper option was also the highest scoring in Gameweek 4, after claiming back-to-back clean sheets with 1-0 win at Swansea City. Elliot boasts a 21% ownership, boosted by 38,000+ new owners following Sunday’s haul – more than any other goalkeeper. A winning header helped him to a 15-point tally as the top-scoring defender in the Gameweek. Lascelles is part of a Newcastle United backline that has conceded only three goals and faced 43 shots, the fifth best in that category in the League. His two assists at Goodison Park took him to 32 points and to the top of the FPL standings. Davies ranks second overall for attempted crosses (32) and chances created (13), and top among defenders. He joins Mohamed Salah (£9.1m) on two Dream Team appearances. The victory at Southampton earned Femenia a third successive clean sheet. He has received two bonus points in each of those matches and, despite picking up an injury at St Mary’s Stadium, he is second only to Davies for transfers in among defenders. The playmaker arrived at Brighton this summer having created 98 chances in the Bundesliga for Ingolstadt last season – more than any other player. But it was his two goals that proved decisive in a 3-1 win over West Bromwich Albion. Shifted to the left wing against Manchester United, that merely provided the platform for a brace of goals that gave the Cameroonian his Dream Team debut. An ICT Threat score of 112 was the best in Gameweek 4 and was made up of six shots, four from inside the penalty area. Strongly fancied as an FPL target in pre-season, the winger has struggled to cement a starting role in Pep Guardiola’s line-up. Coming off the bench against 10-man Liverpool, Sane took his opportunity, scoring twice in 33 minutes to stake a claim for a start at Watford in Gameweek 5. The midfielder's deflected effort produced his second career Hammers goal in Monday’s 2-0 victory over Huddersfield Town. That was Obiang’s first shot of the season, having hit the target only twice from nine attempts in 2016/17. Two goals and an assist in a win over AFC Bournemouth gave Welbeck 16 points - the highest of any forward this season. His Bonus Point System tally of 71 is also the best score achieved by any player in 2017/18. Having lost 197,000+ owners since the opening Gameweek, FPL confidence in the Brazilian had weakened. But Jesus followed his strike at AFC Bournemouth with a brace against Liverpool and is now firmly back in the ascent. Another striker enjoying a renaissance, Kane has overcome a mini-drought with his first goals at Everton. That produced a timely reminder of his huge FPL appeal ahead of four Gameweek opponents who all score two in the Fixture Difficulty Rankings (FDR).